Let me say that it is a real treat to read this book each and every month. When i heard that Geoff Johns was leaving this book and Francis Manapul and Brian Buccellato were taking over made my head spin. I could not see a world where there was a Flash comic that Johns didn't have his hand in. At Comic Con 2011 Manapul and Buccellato put my rest at ease at a DC panel when they spoke about the love and the plans they have for Flash. So here we are in the eight month of the New 52 and this book is killer. First the art is a blast to look at. It feels like Brian and Fancis really sit down and just flesh out how the art and the story are going to meld together. In this issue Flash finds himself stuck in the Speed Force. Flash jumped into it trying to save a boat that was carrying Iris West. Iris was on the boat when it got pulled in a Speed Force by a vortex that Barry thinks he created by just running. Once inside the Speed Force he meet Turbine. Turbine was apart of the Tuskegee Airmen and was pulled into a vortex himself. Flash and Turbine team up to find a way out. 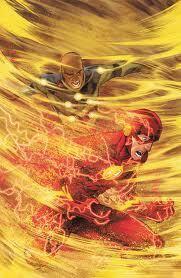 During this time Barry finds out that he needs to run to keep the Speed Force from going haywire. It seems The Flash is the release valve for the Speed Force and if he doesn't run bad things will happen to the time stream. Turbine wants to go home so bad and back to his own time he'll do anything to get back. And that includes killing The Flash. It's smart fun comics with time travel involved that doesn't make you want to bang your head into a wall. Go out and buy all eight issues on sale now.